NWCGA seniors played Cheshire Seniors on Thursday 11th April 2019 at Vicars Cross Golf Club, Chester. The NWCGA seniors’ team were in a competitive mood following our narrow loss at Wrexham Golf Club last year. The morning Greensomes matches were played in fine weather with the course in excellent condition. Cheshire had fielded an extremely strong team with their lowest handicap player playing off +3 and the highest playing off 2!! The Cheshire team were in excellent form and it was no surprise that they won all six morning greensome matches. During the afternoon better ball matches the Cheshire players again played to a very high standard and won five matches. The NWCGA pairing of Andrew Grace & Tony Phillips managed a very commendable half. A good result for Tony, this being his first match for the NWCGA team. Although the result didn’t go the way we expected, everyone had a thoroughly enjoyable day and the welcome forwarded by Vicars Cross Golf Club was first class. North Wales Seniors hosted our annual fixture against Shropshire and Herefordshire Seniors at Prestatyn Golf Club. As this was our last fixture of the season, with one loss against Cheshire in May and a victory against Staffordshire in June our team wanted to finish with a winning season, we were aware that both the opposition and the course would provide a tough but fair test during the day. As we commenced our matches the weather was fine and the course was in excellent condition although a little soft under foot following a weekend of unseasonable wet weather. After the morning Greensomes matches there were NWCGA wins for the pairings of Martin Jones & Steve Neale 3/1, Kevin Sykes & Andrew Grace 2/1, Jonathan Tym & Dave Wright 1H & Ray Ledsham & Tim Davies 2H. The pairing of Adam Houston & Keith Miller halved their match. During the afternoon matches the sun came out and the temperature warmed, and the wind blew a gale making the course very challenging, this didn’t prevent exciting close matches & great performances from players on both sides. In the afternoon better ball matches there were NWCGA wins for the pairings of George Smith & Paul Johns 5/3 & Ray Ledsham & Tim Davies 3/2. The pairings of Martin Jones & Steve Neale, Jonathan Tym & Dave Wright halved their match. It was very pleasing to see that during the day each of the NWCGA pairings contributed points to the overall team score. The top performers for the NWCGA side who won both matches were Ray Ledsham & Tim Davies, Tim was making his debut for the NWCGA Seniors team – well done! After an excellent evening meal, the officials of both Counties addressed the players and thanked each other for a very enjoyable day. Final Result NWCGA 10½ points Shropshire & Herefordshire 7½ points. On a personal note, I would again like to thank all the players who have taken time & made the effort to represent NWCGA Seniors team this year. It is encouraging to see so many new players coming through to represent the NWCGA Seniors team and I am sure that over the next few years we will continue to go from strength to strength. Staffordshire Seniors hosted North Wales Seniors at Barlaston Golf Club on Monday 18th June 2018. With an amicable draw last year at Wrexham Golf Club our seniors were looking forward to a better performance. The course was in good condition and provided a variety of challenging hazards which included a river, a lake, numerous ponds and ditches, blind tee shots and also for good measure. electricity pylons!! Local knowledge & good course management was at a premium. The morning Greensomes matches were played in overcast and windy conditions, with the pairings of Jonathan Tym & Martin Jones winning 1H, Kevin Sykes & Keith Miller winning 1H, Andrew Grace & Karl Lurz winning 2H. The pairings of Allan Merrill & Steve Neale halved their match. A special mention to Allan who flew in from Hong Kong to make up the North Wales team! Even though the wind became stronger during the afternoon the matches continued in great spirit. There were victories in the afternoon better ball matches for the pairings of Allan Merrill & Steve Neale 1H, Kevin Sykes & Keith Miller 4/3, Andrew Grace & Karl Lurz 3/2 with the pairing of Jonathan Tym & Martin Jones halving on the last hole. Top performers on the day for the NWCGA side were the winning pairings of Kevin Sykes & Keith Miller and Andrew Grace & Karl Lurz very well done to both pairings. After an excellent evening, the officials of both Counties addressed the players and thanked each other for a very enjoyable day. NWCGA seniors played Cheshire Seniors on Thursday 10th May at Wrexham Golf Club. The NWCGA seniors team were in a competitive mood following our narrow loss at Bromborough Golf Club last year. The morning Greensomes matches were played in fine conditions and with the course was in excellent condition made for close matches. As in last years match there was only one victory for the home pairing of Jonathan Tym and Dave Wright winning 3&2 and a half was achieved by George Smith and Kevin Sykes. During the afternoon the weather warmed up as did our golf, but sadly we were unable to make inroads into the morning deficit as the six matches were halved three each with victories for the pairings of Chris Marsden and Allan Merrill winning by 1 hole, Jonathan Tym and Dave Wright again winning 3&2 and Huw Robertson and Ray Ledsham winning 4&3. The top performers for the NWCGA on the day were the undefeated pairing of team Captain and Wrexham Captain Jonathan Tym and ex Wrexham member and debutant Dave Wright, very well done to both. Prior to the meal both sides observed a minutes silence as a mark of respect for ex NWCGA seniors player Arthur Jones following the recent sad and unexpected passing of his son John. Although the result didn’t go the way we expected as the result in both the morning and afternoon matches was exactly the same as last years match everyone had a thoroughly enjoyable day and the welcome forwarded by Wrexham Golf Club was first class. Played at Prestatyn GC Tuesday 1st & Wednesday 2nd May in very testing conditions. Report: The 2017 Welsh Counties Seniors Golf Team Championships were held at North Wales GC Llandudno on Sunday 17th & Monday 18th September. The news that last year’s inaugural Championships were a great success must have travelled far and wide which resulted in the number of teams playing increasing from 6 to 9. 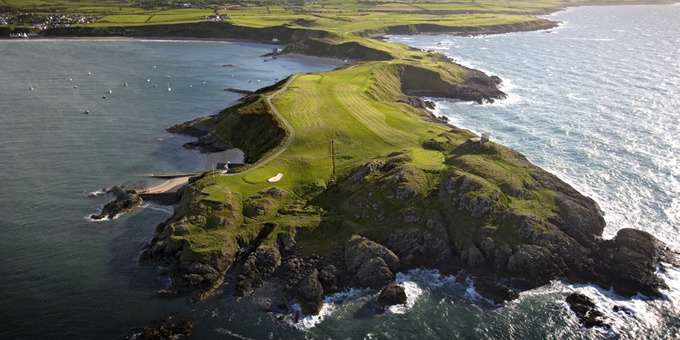 North Wales golf course provided a stern but honest test to all golfers – the CSS being 72 (+1) on both days. The Gross team winners were Montgomeryshire with Glamorgan runners up and Anglesey 3rd. The individual Gross winner was Basil Griffiths, Montgomeryshire with a two round total of 149. The Stableford team winners were the Narwhals with Flintshire runners up and Denbighshire 3rd. The individual Stableford winner was David Humphries, Montgomeryshire with 72 points. The hospitality at North Wales GC was excellent as was the condition of the course, which was superbly presented by the green staff. The competitors were welcomed by the Club Captain Geoff Butterworth, who also presented the prizes. All players commented that they had thoroughly enjoyed the Championships and were looking forward to next years event which is to hosted by Brecon and Radnor. Shropshire & Herefordshire Seniors v North Wales Seniors played at Oswestry Golf Club on Thursday 20th July 2017. Shropshire and Herefordshire Seniors hosted our annual fixture at Oswestry Golf Club. This was our last fixture of the season, with one loss against Cheshire in May and a halved match against Staffordshire in June our team wanted to finish with a victory, we were aware that both the opposition and the course would provide a tough but fair test during the day. We commenced our matches in fine weather & the course in excellent condition. After the morning greensomes there were NWCGA wins for the pairings of Andrew Grace & Ray Ledsham 2/1, Martin Jones & Jonathan Tym 4/3 & George Smith playing with Kevin Walsh 3/2. During the afternoon matches the sun came out and the temperature warmed up as did the golf with a barrage of birdies and great performances from players on both sides. The afternoon better ball matches there were NWCGA wins for the pairings of Paul Stanton & Adam Houston 2/1, Andrew Cave & Mark Perdue 3/2, Martin Jones & Jonathan Tym 2/1 and Karl Livingstone & Neil Brannigan 3/2. It was very pleasing to see that during the day each NWCGA parings won a match contributing to the overall team score. The top performers for the NWCGA side on the day were the undefeated pairing of Martin Jones & Jonathan Tym. A special well done to Martin for his second undefeated appearance. After an excellent evening meal, the officials of both Counties addressed the players and thanked each other for a very enjoyable day. On a personal note, I would like to thank all the players who have taken time and made the effort to represent NWCGA Seniors team this year. It is encouraging to see so many new players coming through and representing the NWCGA Seniors team and I am sure that over the next few years we will go from strength to strength. With your enthusiasm and willingness to play it makes my role very easy and I thank everyone for that. NWCGA seniors played Staffordshire Seniors on Wednesday 21st June at Wrexham Golf Club. With a narrow defeat last year to Staffordshire the NWCGA team were up for the challenge. The course was in excellent condition, a good breakfast set us up for our morning ‘9’ holes followed by lunch prior to the ’18’ holes in the afternoon. The morning greensome matches were played in hot and sunny conditions with the pairings of Paul Stanton & Martin Jones winning 3/2 and Steve Neale & Mike Lowe winning 2/1. The pairings of Andrew Cave & Kevin Sykes, Jonathan Tym & George Smith halved their matches. The matches continued in great spirit during the afternoon even a few showers didn’t dampen our enthusiasm. There were victories for the pairings of Chris Marsden & Huw Robertson winning 6/5, Paul Stanton & Martin Jones winning 3/2 and Steve Neale & Mike Lowe winning 2H. Top performers on the day for NWCGA were the undefeated pairings of Paul Stanton & Martin Jones and Steve Neale & Mike Lowe very well done to both pairings. A special well done to Steve Neale for a second undefeated appearance. After an excellent evening, the officials of both Counties addressed the players and thanked each other for a very enjoyable day. NWCGA seniors played Cheshire Seniors on Friday 12th May 2017 at Bromborough Golf Club. The NWCGA seniors team were in good spirits and expected great things following our victory over Cheshire last year. The morning Greensomes matches were played in wet conditions which seemed to suit the home side better with only one victory for the pairing of Steve Neale & Keith Miller who won 3/2 and a hard fought half from Ray Ledsham & Huw Robertson. During the afternoon the weather conditions improved as did our golf, but sadly we were unable to make inroads into the morning deficit as the six matches were halved three each with victories for the pairings of John Williams & Adam Houston winning 1H, Steve Neale & Keith Miller again winning 2/1 & Karl Lurz (President NWCGA) & Jonathan Tym winning by 1H. The top performers for the NWCGA side on the day were the undefeated pairing of Steve Neale & Keith Miller, very well done to you both. Although the result didn’t go the way we expected everyone had a thoroughly enjoyable day and the welcome forwarded by the Cheshire team and Bromborough Golf Club was first class. Played at Padeswood & Buckley Monday 24th & Tuesday 25th April in very testing conditions. NWCGA seniors played Staffordshire seniors at Newcastle under Lyme on Wednesday 29th June 2016 & NWCGA seniors were leading 3½ points to 2½ points in the morning foursomes but the course was deemed unplayable. The matches were played on Wednesday 7th September to conclude the overall result, carrying the 3½ to 2½ into that day. After a hard fought battle NWCGA Seniors eventually lost the match 7 points to 5 points. However we had a lovely day with the weather being fabulous & we all made some good friends along the way. This was the only match we lost all year, which was very disappointing, however the standard of golf we played was outstanding. NWCGA seniors played Shropshire & Hereford on Wednesday 13th July 2016 at Maesdu GC. A great day’s golf starting with the weather being very warm & the NWCGA team playing probably the best golf to date the reward being an overwhelming result of 16½ to 1½. The 1st hole opens up with a par 3, Chris Marsden (NWCGA) opened his Greensomes round with a hole in one, holing his tee shot with a 9 iron. Although Chris didn’t witness the ball going in the hole, he was soon made aware of his feat with the group on the 2nd tee shouting as the ball vanished down the hole. Chris bought everyone a drink at the end of the day, which went down very well with both teams. This concludes the 3 matches we had planned & we finished unbeaten in all 3 games with the best result defeating Cheshire who hadn’t lost up to that stage. The match was played at Prestatyn GC on Wednesday 6th July 2016. Due to unforseen circumstances both teams played 10 players each instead of 12 players. Two players from both sides dropped out at the last minute! NWCGA seniors played Staffordshire seniors at Newcastle under Lyme on Wednesday 29th June 2016. A team of 12 players turned up for the match as arranged, and during heavy rain we played the morning Greensomes, at lunch NWCGA seniors were leading 3½ points to 2½ points, but the course was flooding, especially the greens rendering the course unplayable. The head green keeper spoke to myself and the Captain of Staffordshire and explained that the course would remain closed for the rest of the day. The decison was taken that we would return on September 6th & play out the remaining 4BBB matches to conclude the overall result, carrying the 3½ to 2½ into that day. It was a very long trip to play for 2 greensome pairs, only 6 holes, and because of the greens they called their results a halve, however everyone was in good spirits and all look forward to the return, to which everyone on the day said that they would do. After a promising start on Monday with 60 competitors out on the course enjoying the sunshire the competition was reduced to an '18' hole event due to adverse weather conditions on the Tuesday rendering the course unplayable. Winning the NWCGA Senior Open Championship was Grahame Barrett from Dukinfield GC with a gross 73 on the back '9' from Timothy Christie, Northenden GC also with a gross 73. The match v Cheshire Seniors was played at Prestatyn on Thursday 21st April 2016. After a cold morning start the greensomes results were NWCGA 3½ to Cheshire 2½ giving a one point lead going into the afternoon 4BBB matches. The afternoon 4BBB matches resulted in a draw making NWCGA Seniors the overall winners by one point. All the players thoroughly enjoyed the hospitality shown to us by Prestatyn Golf Club. Many thanks to everyone at the club for a very good day.